The kitchen is one of the most important rooms of any living space, and it's probably one of the spaces you use most in your apartment. With that in mind, shouldn't it be everything you want it to be? While you may not be able to take on a complete kitchen renovation in a rental unit, there are some kitchen upgrades you can do in an apartment without losing out on your security deposit in the process! If your apartment kitchen has plain drywall throughout, consider adding a fun and temporary backsplash using wallpaper. You can find wallpaper that looks like real stone (if that's the look you're going for), or go for something a little more bold (like a creative pattern). Either way, wallpaper can make for a great (and easy-to-clean) backsplash that you can simply peel away before you move out! If your current kitchen hardware (including cabinet knobs and drawer pulls) aren't quite your style, consider swapping them out with ones that are. You might be surprised at what a difference a fresh set of hardware can do in your rental kitchen space, and you can always swap them back out for the originals before you move out. Hardware is relatively inexpensive, too. Just make sure you won't need to drill any new holes to install your drawer pulls or cabinet handles. Add storage space and counter space with a portable kitchen island. Depending on the size of your kitchen, you could even use your portable island for additional seating when you're entertaining guests! If nothing else, this can be a great area to prep food. Many portable islands even come with unique storage features like wine racks and hangers for pots and pans so you can really maximize space. They also come in a wide range of styles and colors so you can find one that suits your unique wants. 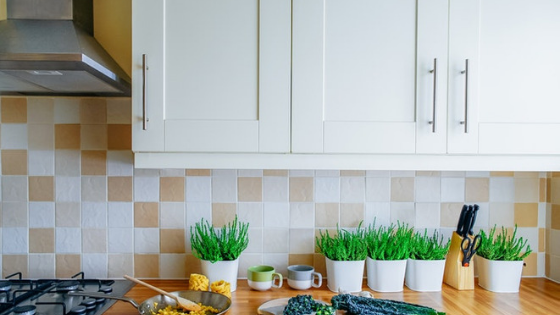 These are just a few ideas for personalizing your apartment kitchen space without spending a lot of money or making any major changes in the process. Looking for apartments in Chicago with beautiful kitchens? Contact North Harbor Apartments today to get started!